Last Saturday morning, while our heads were still on our pillows, my husband's eyes popped open and he said "I've been meaning to tell you this. I've dreamed of a cake three nights in a row, but I keep forgetting to tell you about it. It's one of those crêpe cakes. The flavor is chocolate-amaretto, and it has a maraschino cherry on top. I think you are supposed to make it." I knew he wasn't fabricating a story to coerce me into making something he was craving. I know for a fact that he'd rather eat a pickle on top of cake than a maraschino cherry. I took this news as a sign, or maybe it was some kind of divine appointment with cake. Whatever the case, I felt his dream should be made a reality- with one exception. I decided to spare him the cherry. This was my first time making crêpes, so I took some time researching crêpe recipes. They all seemed very simple, but it was the batter swirling technique I was worried about - and the pan. The fancy pan. You need a fancy crêpe pan to swirl the batter properly, right? Well, that's what I thought. I took a chance with my beat-up non-stick pan with the wobbly handle. I swirled, I cooked. I didn't lose my head. Everything turned out fine! I let Mr. Baird taste-test as I developed the whipped filling recipe. I wanted to make sure it matched his dream-memory. I also made a chocolate amaretto ganache - a bit too much, it turns out - so I made truffles with the leftovers. The resulting cake was delicious, and the many-layered texture is so divine! So. Who can say if -or why- I was meant to make this cake. Maybe it was to overcome my fear of crêpe-making. Maybe it was a way for my husband to purge the cake-clutter from his unconscious. Maybe it was so I could share it with you fine people. Who can say. Sometimes you just have to eat cake and let the mystery be. Please be sure to read the comments before attempting this cake. I found the crepe-making to be simpler than I expected, but others are having trouble. Some find this cake tedious and some just did not care for the cake's flavors. This cake consists of many layers of homemade crepes - and in the name of clarity - yes - it takes a little more time and effort to put together than a regular layer cake. Note: Have ready a pastry brush and a little cup of melted butter before you begin cooking the crepes. This is for brushing and the pan with butter. Place all ingredients in the bowl of a food processor or a blender and process until well combined. The mixture will be the consistency of heavy cream. Brush a 9 or 10 inch skillet with melted butter and place over medium heat until butter just starts to smoke. Pour scant 1/4 cup of batter into the skillet. Swirl the batter with the pan lifted over the stove eye until the bottom is coated with a thin layer of batter. Place pan on the stove eye and cook until the surface of the crepe loses most of its glossiness and the top is set. At this point, most recipes will tell you to flip the crepes; mine were cooked through without flipping, so I just slid them out of the skillet and onto a plate. Repeat process until all crepe batter is used. Allow the crepes to cool completely. Whip heavy cream in a large bowl on medium-high speed with a hand mixer or using a stand mixer fitted with the whisk attachment. Gradually add the granulated sugar. Mixture will begin to thicken. Gradually add in the unsweetened cocoa powder. Add the amaretto liqueur one tablespoon at a time, and then add the almond extract. Whip until stiff peaks form. Set aside. Note: This recipe can be halved if you don't plan to make the amaretto truffles. Roughly chop the chocolate and place it in a medium bowl. In a small saucepan, heat the heavy cream over medium-high heat until just boiling. Center a crepe on a serving plate. Using a pastry brush, very lightly coat the crepe with chocolate ganache while it is still thin (if ganache begins to set, you can gently heat it in the microwave at 20 second intervals). Thinly spread a little whipped filling over the ganache and top with another crepe. Continue brushing, spreading and stacking, ending with a crepe on top. Set aside. When remaining chocolate ganache is of spreading consistency, use to frost the cake. Let stand at room temperature until set. Note: If making entire ganache recipe, remaining amount can be chilled and rolled into truffles. Roll truffles in cocoa powder and garnish top of cake, if desired. I have always wanted to make a crepe cake. They somehow always look so beautiful. How funny - I've been dreaming of crepe cakes too!! Although mine involve some sort of fruity curd... This looks delicious! Wow. This looks incredible! I bet it tastes even better! Well done Heather! Your husband is a lucky man. I love amaretto, so the filling sounds like something I'd love. I've never made a Crêpe Cake, though I know how to make crêpes. I bought a fancy pan, but you are right. I do just as well in my old non-stick pan. As always, this is beautiful. Let's hope your husband has many more dreams about amazing desserts like this one. What a cake! The thin layers on this cake are absolutely beautiful! I love this! Mmmmm, this looks fantastic! Crepe cakes are simply wonderful. you were probably meant to make it so that you could photograph it and make me feel like i'm there eating it :) you know, probably! Seriously beautiful photos. I have always been fascinated by crepe cakes and your photos sealed the deal. Great post! My husband is more likely to fabricate a desired treat-dream-- and then I'd end up making a triple lemon cheesecake every single week. Anyway, this treat looks fabulous. I'm planning to make it this week! Holy cow this looks gorgeous! OH MY GOODNESS GRACIOUS! super amazing cake! because it's made out of crepes, does this mean i can eat it for breakfast? What a dream! I wish my husband dreamed about cakes and told me to make them haha :). I have had a Crepe Cake on my "must-make" list for quite some time. After seeing your, I know I've got to try it out soon! What a fantastic lookingncake! Ive been wanting to make a crepe cake for quite some time, but theblast time I made crepes, it wasn't pretty. But I do hope to make one some day. Your cake is so incredibly tidy:)!!! I've been wanting to make a crepe cake for a while now. I bet the texture is amazing. I wish I had dreams about recipes. Maybe someday. Espectacular!! con esta tarta sorprendes a todos, me lo apuntaré para hacerla algún día. Oh, this cake seems to be like a piece of heaven. I am sure it also tastes good - a cake for a pancake and chocolate addicts:)? This is an amazing looking cake; very impressive. I love the simple styling of your images too. 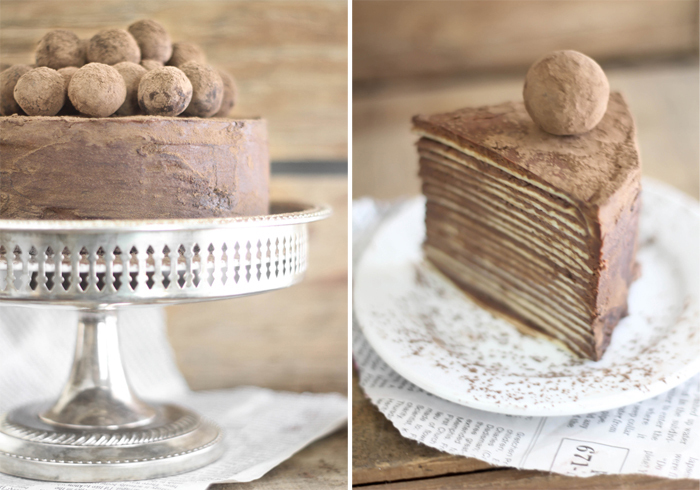 I've always wanted to make a crepe cake and yours is fabulous! This is so beautiful and GENIUS. 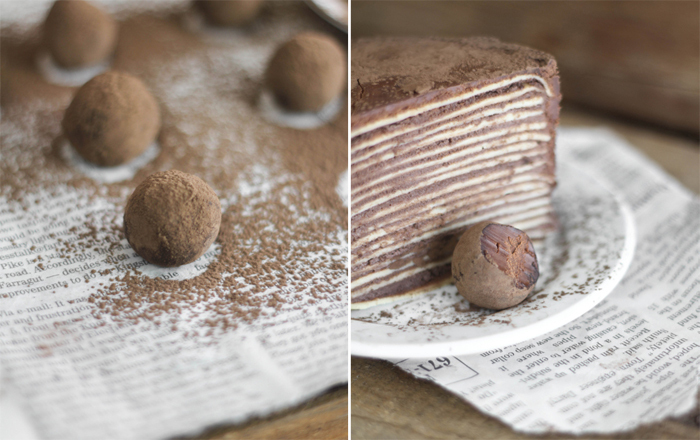 You could substitute chocolate for other flavors, (in my mind, why in the world would you) or halve the recipe to make a little crepe cake! I love it. I've seen photos of a crepe cake but I've never tasted one. What vivid dreams that man has! Aww I think it's so cute how your hubby tried to manipulate you into making him a cake. You've inspired me to conquer the crepe cake in the near future. This is just beautiful. Love the truffles as well. Oh man! Crepe cakes are my dream cake. I have yet to make/eat one, but maybe now I'll finally do both. It's just the prettiest! That Mr. Baird is a real dreamy guy.....oh, and the cake is dreamy too. I've never made a crepe cake! I love that you made such a beautiful one without the *fancy* crepe pan. I think it's neat that your husband dreamt about this cake and you made it a reality for him. I've had a red velvet crepe cake before and it was really good. The slices are so pretty with all those layers! Gorgeous gorgeous! I have told you this before, but you make the most incredible cakes I have ever seen. I love crepes but I'm not sure I'm going to try this one. Looks intimidating! My husband swears by his cast-iron skillet for crepes. So pretty! It looks kind of like vinarterta. I love those truffles up top! I've been wanting to make a crepe cake, but I just end up eating all the crepes before I can stack them. This is so, so lovely...way to be! This would make such a lovely treat for my husband (and me of course ;))! WOW! Lovely, elegant, simple and delicious no doubt. Congratulations for another great creation! That. Looks. AWESOME! My dad has a recipe for crepes and I always have a craving for them. I've never heard of a crepe cake until now, but it looks pretty good! Wow truly this looks so impressive I will have to attempt to make this. I love your blog and I check it every day. You are an amazing cook who is very inspirational. Keep up the wonderful work. You are well loved by your fellow food lovers and bloggers. Sending love from Canberra Australia. Simply amazing and so elegant! I love to make crepes but have never seen a cake made with them before! This cake is beautiful! Now I've craving amaretto and chocolate too! Seriously? I want to eat my computer screen right now. Yum!! Not only does this cake look amazing - - but it sounds so decadent and delicious. This recipe is truly blowing my mind :) YUUMM! Again a stunning piece of art. I can see every crepe layer there is in that stack. Gorgeous! I've never heard of a crepe cake...I do love crepes (I've made them myself numerous times, but never thought to layer them to make a cake! )& I love amaretto...I just might have to try this out for myself. P.S. Your photos are amazing! I just love all your recipes (and your photographs)! I've made a couple, and they turned out so perfect! I think I shall try this, too. Thank you for all that you do! Wow this looks amazing!! What a simply beautiful cake...mmm would love a slice. I have actually never seen a crepe cake before. It is stunning! And I love the chocolate-amaretto! Yum! I could just eat this picture, ONCE upon a time this will be made in my kitchen. Amazing. Just...amazing. Amazing cake! Question for you... how did it turn out so even? Most crepe cakes I've seen sag down towards the periphery of the cake. Is there some special secret?? If so, please share, thanks! I am not a huge fan of chocolate but this cake actually brought tears to my eyes. It doesn't get better than that. Your cake looks gorgeous and I want some. You give me hope when you tell the story of making crepes in your normal pan and then turning out. I've been putting off making my first crepes for a long time, but this cake might be just the inspiration I need. It's absolutely gorgeous. Wow that is one amazing cake!!!!!! It must have been divine inspiration because it really does look amazing!!! How on earth did you get it so perfectly smooth? How do you do what you do? This is beautiful. I don't see how you do it. Most crepe cakes I've seen are sloppy looking, but you manage to make this stunning cake with simple elegant perfection. This looks absolutely beautiful! All of your baking looks like artwork. My sister makes crepes all the time, but I haven't done that yet either. Sometimes we'll make Chicken Divan Crepes for dinner, or some sort of mousse filled crepes for dessert when we get together, but I have (thus far anyhow) always left the crepe making to her. Funny I made savory crepes for a age old manicotti recipe in my husbands family and my mother helped me... as we were making the vessels for the delicous cheese filing we thought how could we make dessert out of these puppies...here you have it, replace some of the flour with sugar and vanilla and we're there! plan to do some type of salted caramel filing with a whipped cream mix...YUMMMMMMMM. Absolutely beautiful cake, hope mine turns out as pretty! Ohhh my heavens! This is like the most beautifully rustic cake I have ever seen!!!!! What a lovely cake and story! This cake looks to die for! I definitely want to try making this. Amazing! I love crêpe cakes and this one looks stunning! Chocolate and amaretto are definitely a fantastic combination, so I'm sure this cake can only be delicious. I love your photos, too. I love the colors, it's like a sepia. And the cake WOW!! I made this! and it was fabulous! the whipped filling and chocolate ganache were absolutely incredible. Thank you for a great recipe, Heather! Whow! That cake looks amazing! I tried making one of Martha's crepe cakes ones before. But it turned out to be one big laugh. I think I used way to ganache between te different layers. I think I have to try it again but now use your recipe. I've never heard of a crepe cake before and now so very glad I did! This cake is so original! I love it! What an incredible cake! Love this! Made it last night. Delicious! Dude, Dude - what sweet perfection. How on earth do all of your desserts come out so clean and gorgeous. Love the cocoa dusted finish! My son-in-law used to own a crepe cafe here. He is now a high school English teacher, but he still makes a mean crepe! I have never thought of making a crepe cake!! I cannot wait to try this out! any chance you have a good gluten free crepe mix? I have always wanted to try one of these but that image of my leaning tower of crepes with the duds hanging burned from the side of my pan or from the top of my head (where I felt the spirit of Bobby Flay run through me in a moment of flipping glory that turned south) keeps me from doing so but gee, is that a beauty! I love that picture with all the truffles piled on top. What a great cake. Beautiful! Heather that is one beautiful cake. And the photos are amazing sweet girl. Love you! Heather you astound me every time! This cake is absolutely stunning. I love all those beautiful layers! Wonderful post! There are only two possibilities: You're an angel or you're a witch... :)) This cake is beyond imagination! Oh my goodness!! This looks gorgeous! How do you manage to keep your crepe cake so levelled? I recently tried my hands on make a crepe cake and it turned out slightly domed. I think it also has to do with the fact that my crepes were thinner along the edges since you swirl the batter in the pan. Looks almost too good to eat! This is definitely divine! I almost tasted your crepe cake while reading your blog. Too bad, my skills ain't as good as yours. Is there anyway you can ship it out instead :) YUM!! I've been staring at this off and on since you posted it. Always in utter amazement. I go into a sort of trance at the sheer beauty of it. Then I think about how delicious it must be and I decide I'm going to make it. Then I chicken out because crepes scare me. Very good idea, lovely recipes. Fantastic cake, I will try it for my birthday. I've never made a crepe cake but this one is to die for.. I just made this...actually pretty easy. Spent one evening making the crepes, and I counted yours...you had 17, I think I only had 14. Then this morning I made the ganache and the whipped cream and put it together in just under two hours. Can't wait to try it! Thanks for the recipe...love your website! I made this yesterday for my and my husbands Valentines Day! I did alter it slightly, since we dont have alcohol in the house I instead used a scoop of nutella... It was amazing! I had a little trouble with icing the outside, but I figured out that it needed a "crumb coat" first and then a second smooth layer! It was also my first time making crepes, and I think they came out pretty good! Thanks for the great recipe!! WOW that really looks amazing! This looks divine! Beautiful presentation, too. 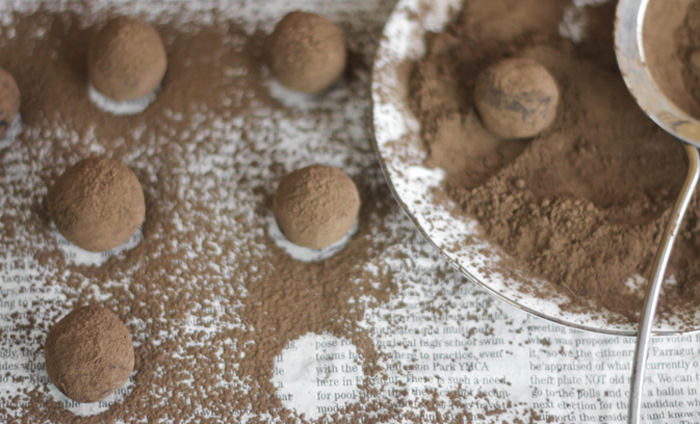 I love the newsprint and cocoa powder. Elegant!! Gorgeous, gorgeous photography! Just lovely. What a fantastic dessert. I made this last week and it turned out fabulous. I made it all at one time, going slowly taking my time. I did make the crepe mixture the night before to set up in the refrigerator. First time making crepes, used a silicone sauté pan and it worked great. I got 20 crepes out of the mixture..didn't waste one. I set up an assembly line to prepare, putting the ganache on all 20 first, then the whipped cream mixture, then assembled each one...worked very easy that way. The frosting worked great. I was anxious to finish, but did have to wait a little as you said for the ganache to set to a spreading consistency. I had enough ganache left to make 5 truffles for the top, making the whole ganache recipe. The taste was exceptional. This reminded me of a European pastry. Thanks for such a great recipe and step by step directions. It's definitely a keeper. I just try to make this cake but it was a complete disaster, and I am not sure why. Could it be the cream fault? I live in NZ and the "heaviest" cream I could find here was 38%, when I added the other ingredients it was just too liquid y, and when I am assembling it the cream was just pouring out from the layers of crepes. Also I used smaller pan, and only end up with 13 crepes, which seemed to be thinner than yours. Should I use mascarpone in the filling or add some gelatine? I have been going back to this recipe for a few weeks now and, finally, yesterday decided to make it for a girl's night. The flavor was amazing! However, as some others mentioned, I also had problems with a soft cream and a dome look to it instead of the squared off look in the photos. I think my kitchen was too hot since I was also working on some canning projects and cooking the dinner while assembling this cake. I will definitely be making this again and will probably modify it by building it in a springform pan and freezing it to set up before frosting it. Your cake looks so good! I can't wait to try! Do you really use three different creams, one for each part of this recipe? I used heavy whipping cream for all three parts. My grandfather (who made it to 101, but left us almost 4 years ago) would make his crepes on the bottom of a flipped over pot that completely covered the eye on his electric stove. I think the batter must've been thinner because it would run out thin when he poured it on. He would end up with drips on the stove top once in a while, but really not often now that I think about it. I would eat them as fast as he would make them. I may have to try this, it sounds SO yummy! 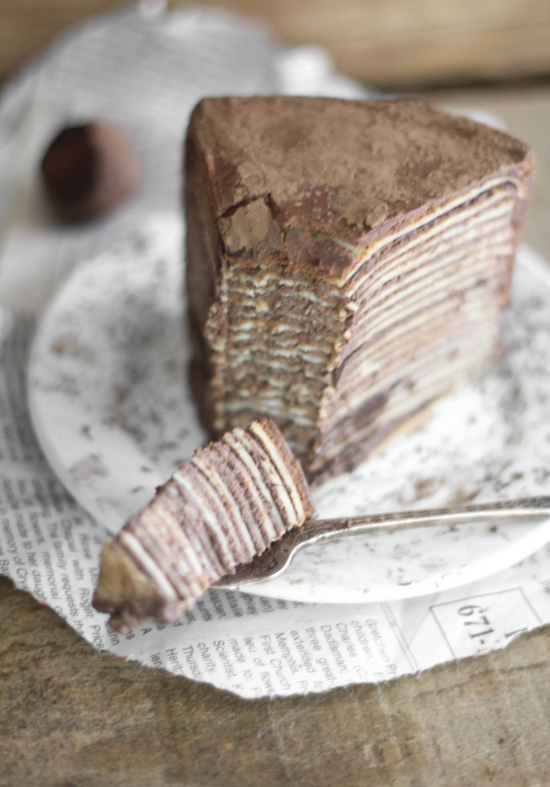 I don't even particularly LIKE crepe cake, but want to make this anyway just because it is so strikingly gorgeous. ...I guess I could also make a different cake and just borrow the look of the exterior. Hmm. how many crepes did you end up having from this amount of ingredients? thanks much! I got about 18 crepes. Some people reported getting more, but I think 18-20 is normal. Yes - safe to make ahead. It should not get soggy! Well this cake was a complete frustration for me. I love the majority of your recipes on here and thank you for all that you've posted, but this cake just would not cooperate. The filling wasn't the right consistency, and tasted way too sweet with the tsp of almond extract and amaretto. I finally scrapped it after trying to fix it and went with a regular vanilla whip cream filling. For the ganache I only used 1 tbsp of amaretto and that was enough for me, 2 would have been overpowering. I got 17 8-inch crepes out of the recipe, only scrapping one. The crepe recipe seemed quite egg-y to me, normally I only use 2-4 eggs so 6 was different for me, but still a nice flavor. Overall I felt some of the proportions just were off - an entire tsp of almond extract is overpowering, and then to add the flavorful amaretto on top of it was too much. Pretty bummed that it didn't go as I had hoped, as yours looks amazing, but overall I'm satisfied with the changes I made. One flop out of 15+ recipes I've tried from here is still a pretty good record! Bummer, Sean! So sorry it didn't go as planned. Maybe your almond extract was stronger than my garden variety grocery brand. I'm still very new to crepe making, so your comment makes me want to try other recipes with less eggs. Thanks for the feedback - it's very helpful! i'm trying to find out how long it takes to make and put this thing together!!! I find no information. Anyone? I'm trying to make a good looking crepe cake, please give me some tips on how to make all the crepes the same size and same thickness? yours looks absolutely perfect! This looks pretty good. Honestly, until I just read this post I have not read about crepe cakes. This is new territory and the comments are also helpful. I have made holiday Gâteau cakes with thin layers of sponge - can't wait to try making a crepe cake! I think maybe you left out egg whites in this recipe for the filling. I am very familiar with crepe cakes and have made them before, but this filling -- without the egg whites -- never forms peaks...since the egg whites are usually what gives it the "fluff." Therefore, the filling is just kind of juicy. It soaks into the crepes, and doesn't give you that light, wonderful creamy taste that crepe cakes do. 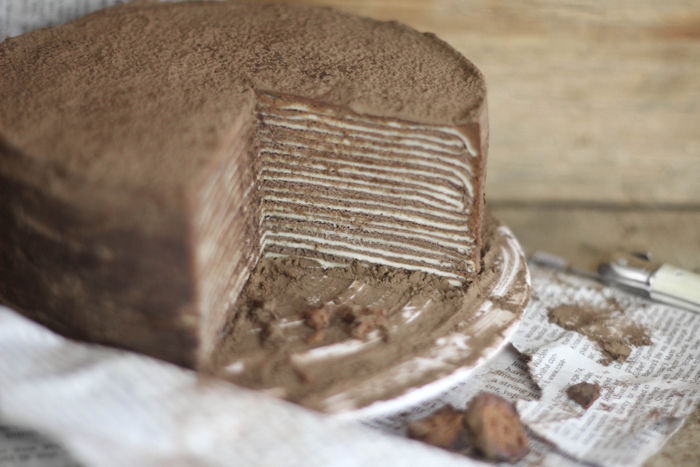 My suggestion: if you want to get a crepe cake that looks like this one...swap in another filling recipe. Or add 4-6 egg whites. Hi Mandyj78, I didn't leave anything out of the filling. I made this cake just as it is written, and the filling didn't soak into the crepes. Are you sure you used heavy whipping cream? It does form stiff peaks. Yep. Used heavy whipping cream. just a a heads up to any readers who are making it for a special occasion. I made three batches. Finally added egg whites to get a crepe cake fluffy filling. I'm sorry you had trouble. I used Epicurious' Grand Marnier Crepe Cake as my inspiration for this one, and it doesn't use egg whites in the filling. I appreciate your comment and hope it will help someone struggling with this recipe. A last word about the filling- it should be kept cold. And it should be stored in the refrigerator until ready for use. Found this recipe on Pinterest. The crepes themselves taste so so so good. But cake did not impress me. However it was super easy to make. I might use different sort of filling next time. Update: my husband thought the cake was amazing. This just makes for the most beautiful presentation!!! this looks absolutely amazing! i am making it for my sister's birthday and i could not be more excited! quick question, when taking the the crepes out of the pan did you just put them all on one plate or did you separate them while they were cooling? Got a simple question. For the crepe recipe, there is a 1/2 cup of cream. Is it heavy whipping cream?? Thanks so much for this recipe! I tweaked it a bit (didn't have any amaretto in the house) and made it an irish coffee crepe cake (Bailey's, cocoa, and espresso powder... yumm!). Mine didn't turn out as pretty as yours. Perhaps I didn't let the ganache cool long enough? I also found that the layers wanted to slip around a bit as I got toward the last of the layers. The cake ended up dome shaped, but it tastes wonderful. And it was perfect for a very warm summer day when I needed a cake (did NOT want to turn on the oven). And I just wanted to say, as a perfectionist, it was nice to not have to have the crepes all exactly perfect. They were all going to get covered and filled anyway, so a few little tears or jagged edges didn't matter. I want to make this cake for my boyfriend b-day so I have just one question before start making the cake...One cup means how much? in grams? It depends on the ingredient - here's a link to some baking conversions to grams. I use this often. Hope this helps! what kind of cream do i nead to use in the Crêpes recepie? 1. I used (and I hope you're supposed to) heavy whipping cream for all of the "cream" ingredients. It says something different in each part of the recipe, but I believe they are all meant to be heavy whipping cream. 2. I almost ran out of the chocolate-amaretto whipped filling. When/if I make the cake again (we'll see how it tastes tonight) I'll probably add a bit more cream to make more filling. I'm not that heavy of a froster but I'll look at the layers when I cut into it and see if it looks like some were too thick with filling. 3. I made the full recipe of ganache and only had enough left over for 3 medium sized truffles. Again, I'm not a heavy froster on outsides of cakes (I like them to be smooth, but not overly layered in frosting) so I don't know how I ended up with so little leftover for truffles. I don't know how someone could make half of the recipe and have enough for each layer and the outside. I will say that as I was making the cake, each part of it tasted amazing. I can't wait to eat it tonight. From start to finish it probably took me about 4 hours. While this is a good amount of time for a smallish sized cake in the end, I liked that I could make it all in one evening. How tall is the cake? I'm making the crepes now and it seems it'll end up hitter than I expect. Hi Kathy, I can't remember its exact height... but when I first made it I thought the finished result looked small -it was smaller than I expected. But it's really big on flavor, so I didn't mind so much. Me again - Just wanted to report back about how great the cake turned out. Since I doubled the recipe, it did end up pretty tall, maybe 5 inches or so. Since I don't have the skills to make such a beautifully refined finish, I went the "rustic" route by smothering it with ganache and then sprinkling it with toasted and chopped almonds. The flavors were really great, though I did leave out a tbsp of amaretto in the whipping cream based on an above comment that indicated it was flavored too heavily towards that end. Either way would have been great. I suppose it's just taste. Just wanted to thank you for introducing me to the most exciting cake I've had the pleasure to cut into. And also thanks for responding to my post when I know you must have been super busy. Hi. I'm planning to make one for my boyfriend but the thing is, I dont know if amaretto liqueur is available in the market here in philippines. Can I just cross that one out? Cake looks gorgious!! You are so talented!! Wondering if this cake freezes?? Holy Moly - I'd be all over that! Hi again, would love to try cake it's absolutely gorgious!!! Need to know if cake freezes well would love to do ahead of time... Thanx! I made this "cake" today, and it turned out to look more like a pie than a cake. I ended up with about 12 - 14 crepes. I followed the instructions to the letter regarding the amounts for the ganache and the filling. The cake is probably about 2 1/2 inches in height. If you decide to make it, double the amount of filling so that the cake will have some height. The filling is delicious.